Labeling electrical conduits is an important part of any new equipment installation. Equally important is keeping the labels on the conduits in good shape so they can be easily read. There are many reasons why these types of labels are such a good idea, not the least of which is the convenience they offer if something goes wrong. While labeling a conduit may seem like a simple and almost unimportant task, that is not the case. Electrical conduits carry deadly amounts of electricity. When people access the conduits for maintenance or other reasons, the information on the labels can literally save lives. In addition, having equipment like this properly labeled can dramatically speed up the troubleshooting of problems since the technical team will be able to quickly determine where they need to go to find the issue. The ASME A13.1 standard from ANSI is the most important standard related to labeling electrical conduits. It establishes a common system that can be used in almost any environment. While this set of standards applies to many types of piping systems, it is also used for electrical conduits. As with all ANSI standards, this standard is not legally mandatory. Despite this, most companies follow this standard because it has been proven to be very effective. It also makes it much easier (and therefore more affordable) when a company brings in a third party contractor to work on the wiring system. 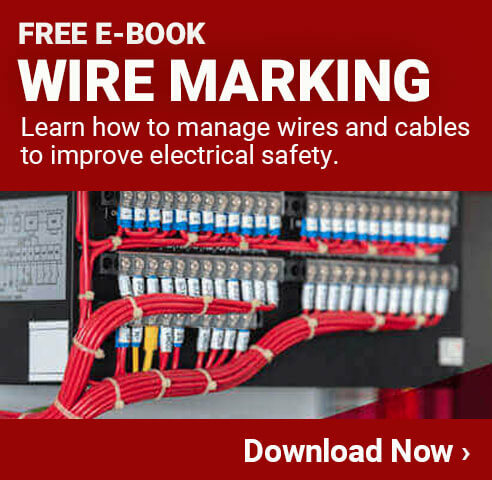 Following a common standard will ensure people working on the electrical system know what to look for. In addition to making their jobs easier, it will also make it significantly safer for everyone involved. Outside Conduit Diameter of .75-1.25" requires a label length of 8" and letter height of .5"
Outside Conduit Diameter of 1.5-2" requires a label length of 8" and letter height of .75"
Outside Conduit Diameter of 2.5-6" requires a label length of 12" and letter height of 1.25"
Outside Conduit Diameter of 8-10" requires a label length of 24" and letter height of 2.5"
Outside Conduit Diameter of Greater than 10" requires a label length of 32" and letter height of 3.5"
Unlike most types of label standards, electrical conduits don't have set requirements. Most of the time people use white labels with black text because it is easy to see. In some scenarios, however, using colors or white text on a black background might be better. Evaluating the location where the conduits will be placed and choosing the color options that are the most visible is the best way to get the needed results. For very small electrical conduits, the standard practice is to use labeling that is as large as will fit. Some very small conduits can actually have tags applied rather than labels. These tags are tied or wrapped around the conduit. While not ideal for most situations, this is something to be aware of. This can also apply when running single wires through an area rather than through a normal conduit. The important thing to remember here is that having labels in place will help no matter the situation. The most important part of any label is the text printed on it. 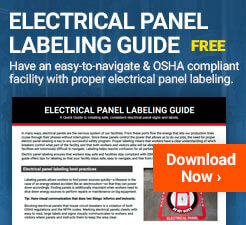 Whether buying electrical conduit labels or printing them in-house, it is essential to ensure all the needed information is contained on the label so that when the conduits are accessed or worked on, the technicians know exactly what they are doing. Voltage - Labeling the level of voltage running through a conduit is critical for safety. The voltage levels will determine what type of safety equipment is required when accessing it. Identification Information - Every conduit should have some type of identification number on it to differentiate it from the others. Whether this is a number, name, or other designation, having it on the label is very important. Source Connection Locations - The label should indicate where the conduit is coming from. Does the electricity come from the main power source, a generator, or a specific junction box? Listing what the next "step" back on the line connects to will assist in finding trouble if there is any. Usage - Listing where the conduit goes can be very helpful. For example, one conduit label may indicate that it provides power to one particular machine. This can reduce the need to trace back the conduit, which can help speed up troubleshooting of issues. Other - Any other information that may be helpful for a given facility. If necessary, it can be a good idea to apply multiple labels to a single conduit. Placing them right next to each other will allow additional information to be provided. Putting the most important information on the label that is placed closest to the end of the conduit (or nearest to an access panel) is the best practice. The official standards do not specify anything about the quality of the labels used, so it is up to each facility to decide on their own. Low-quality labeling solutions can fade or fall off over time, which makes them essentially useless. Long-lasting label solutions are very important because of the fact that the labels typically won't need to be read for years since electrical wiring often doesn't have problems that frequently. One great option is to choose heat shrink labeling. These labels can be printed off either by a third party printer or using a good quality industrial label printer. Once printed, they are applied to the conduit and shrunk down using a heat gun. Once done, the label appears to become one with the conduit itself. The labeling is very durable and long lasting, which makes it a great option. More commonly, companies use their industrial label printer to create custom labels that will stick to the conduit. This is a very economical way to get exactly what you need, when you need it. Most electrical conduits will need to be labeled with detailed information that is specific to one company, which means generic labels won't often meet the requirements. Having the ability to print off custom labels on site is a good option. In addition to being able to get the exact text needed, a facility that uses this option will be able to immediately print off new labels when they are required. If a new conduit is being installed, there will be no delay in getting the labeling done. If a conduit label is damaged, a new one can be printed to replace it right away. As mentioned above, some facilities will use tags on smaller electrical conduits. This is a good solution to have available, but it should not be the first choice. Tags that dangle off the conduit can get pulled off much more easily than a label. In addition, if there are multiple conduits in an area, the tags can get tangled, and it can be confusing to see which tag applies to which conduit. Once the labeling of electrical conduits is completed, a plan needs to be put in place for maintaining them. If a label becomes damaged or gets too dirty to read, then it won't serve its purpose. For conduits that are easily accessible, their cleaning and maintenance can be handled as part of the normal routine for the cleaning staff. Most electrical conduits, however, run either behind a wall, under the floor, or high up in the rafters. When this is the case, they can easily be forgotten. Depending on where the labels are located, they will need to have a scheduled cleaning and inspection at least once per year. It will take time and effort for a facility to adopt any safety effort. Labeling electrical conduits is a simple task that can be done quickly and affordably, and the facility will enjoy the benefits for years to come.